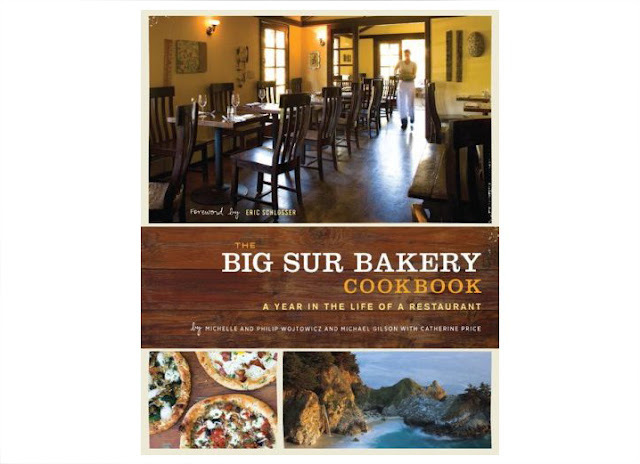 From Amazon: "Here from the celebrated California restaurant Big Sur Bakery is a stunningly photographed cookbook showcasing seasonal ingredients, local vintners, fishermen, and farmers—and the food that makes the Big Sur Bakery unique. Tucked behind a gas station off California's legendary Highway 1, the Big Sur Bakery is easy to miss. But don't be fooled by its unassuming location—stumbling across the Bakery, as countless visitors have done on their way up and down the Pacific Coast, will make you feel as if you've discovered a secret: a gem of a restaurant where the food, people, and atmosphere meld together in a perfect embodiment of the spirit of Big Sur. The three restaurant owners, chef Philip Wojtowicz, baker Michelle Wojtowicz, and host Michael Gilson, escaped the Los Angeles food scene to create their version of the ideal restaurant, nestled in the heart of some of the most beautiful country in the world. This is simple, wood-fired American cooking at its best, executed in a way that lets the ingredients—seasonal and often locally produced—shine. Weekend brunches feature thick, nine-grain pancakes and savory breakfast pizza topped with crisp bacon, fresh herbs, and pasture-raised eggs. At night, Phil offers classics like Grilled Prime Rib Steak with Red Wine Sauce along with twists on traditional favorites like Venison Osso Buco or Rockfish Scampi. And every meal should end with one of Michelle's great desserts, whether it's a homemade Peppermint Ice Cream Sundae or Hazelnut Flan with Roasted Cherries." You can obviously see and learn more from Amazon, but you can also go right to the source here.